The picture is the best I could do with my cellphone. If you look closely at the stairs, which are on the campus of Chosun University in Gwangju, you can see the statement written in Korean "A united world (Korea) without the American Military". 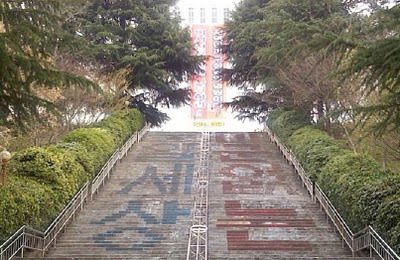 Anti-American sentiment is particularly strong in Jeollanam Province. This particular writing was obviously done long ago and it speaks to the sentiments of the powers that be at the university that they have not been removed since. Nevertheless times have changed and the younger population, even if a portion is still quite anti-American, doesn't have any pressing desire for reunification. The recent "Cheonam incident" makes this all the more obvious. North Korea is a bad dream that few in South Korea really want to think about. UPDATE: You could also translate the above as "A unified (Korean) society without the American military." I actually like that better as it expresses South Korean's longing to be "whole" again and the intrusion and obstruction that they believe the American military to be in their attempts to bring together Korean society.